The arrival day is Sunday, July 26-th. For the rest of the week, we plan to have 2 lectures in the morning, 2 lectures in the afternoon and a student session for questions, informal discussions and tutorials before dinner. The conference finishes on Saturday, 1-st August. Schedule of the summer school. Norbert A'Campo, Universitat Basel : Singularities, Low-Dimensional Topology and Galois action. Courses will take place at Faculty of Mathematics and Computer Science within the University "Babes-Bolyai" of Cluj. The address of the Faculty of Mathematics and Computer Science is 1, Mihail Kogalniceanu Street , in the center of Cluj Napoca (see the general plan). Address: Street Pandurilor, no. 7. The main entrance is from Street Plopilor, Cluj-Napoca, see the Plan 1 or Plan 2 of the area. Phone: +40 264 429 788. The city of Cluj-Napoca is located in Transylvania, the northwest Romania. Usef ul links and information about the city of Cluj, in particular online maps, could be found here: Cluj4All. The closest international airport is Cluj "Avram Iancu" International Airport. 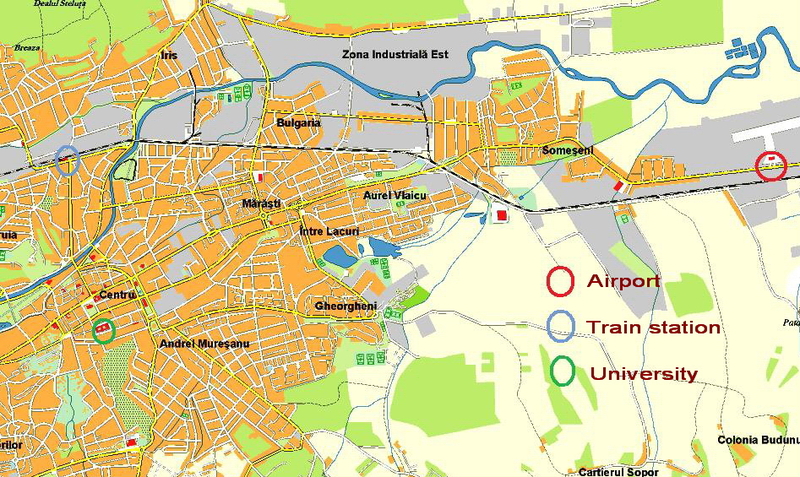 To reach the hotel Universitas from the airport, see: Directions Airport - Hotel Universitas. The easiest way is to take a taxi and we suggest you to command a cab where the company name is visible (Diesel, Terafan) and sometimes also the price by km (usually around 2.35 RON/km). The average cost of a trip is 25-30 RON (with an extra of 30% during the night) and cannot exceed 40 RON. It is safe to ask the driver about the estimated cost before the start. Today 1 Euro is about 4.4 RON. To reach the hotel from the train station: Directions Train station - Hotel Universitas. One could also take a taxi (see above), for a cost averaging 10-15 RON. To reach the university from the hotel: Directions Hotel Universitas-University Babes-Bolyai. The easiest way seems to take the tramway from the station in front of the hotel towards the downtown, to descend at the station BARITIU and then to walk for about 10 minutes. Courses will take place at Faculty of Mathematics and Computer Science within the University "Babes-Bolyai" of Cluj in the Room 5/I (Tiberiu Popoviciu) at the first level of the main building. The way inside the building, from the main entrance, will be indicated. Due to limited funding and space registration is now closed. We cannot accept anymore participants. Andras Stipsicz, Alfred Renyi Institute of Mathematics, Budapest.